While I was trying to subscribe to the LookFantastic Beauty Box, I had a look around the website for more things to buy because I didn’t pack much for my stay in Belgium and let’s face it, there’s never enough beauty products. I chanced upon this Aromatherapy Associates Ultimate Bath Jewels Gift Set at pretty much half price and I couldn’t say no to that! I bought a really tiny sample last year – it’s the same size as one bottle from this set, which is 9ml, and it lasted me for about 3 baths. This set has 10 bottles of different oils, so it should last about 30 baths. This comes in a really nice box – the top flips open to reveal 5 small bottles, with another drawer at the bottom with another 5 bottles. 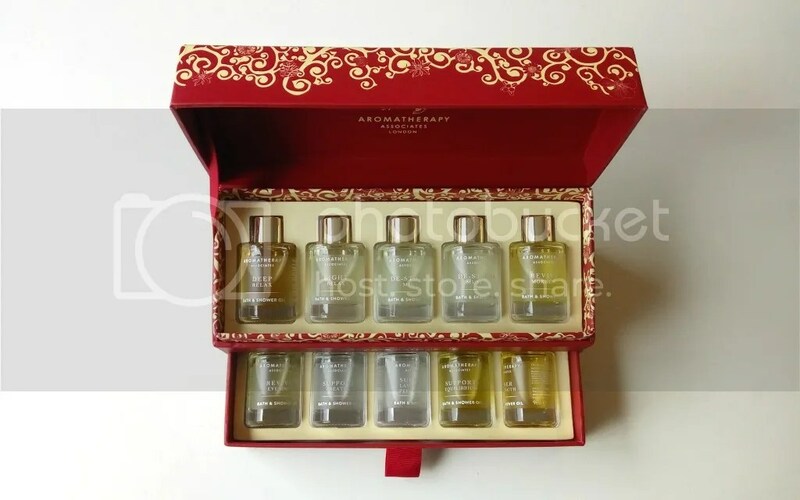 At the price of €38.45, down from its RRP of €76.45, it’s still not cheap, but I really really loved it and I’ve been waiting for the chance to splurge on this or a similar gift set from Aromatherapy Associates. I was waiting for Christmas when it’s time (and I have an excuse) to treat myself, but hey now is a good time too! Yes! They are soooooooooooo awesome! Heh they really are awesome!